Transform any glass or mug into a spill-proof cup for adults. 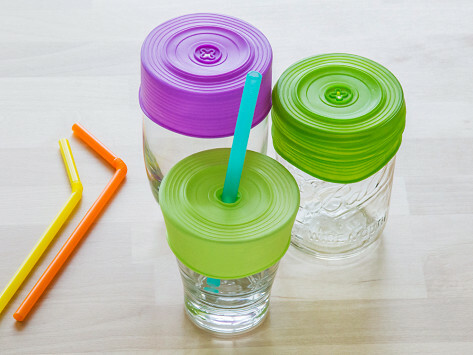 These stretchy, non-toxic silicone lids create a suction seal that keeps beverages neatly contained. And they work just as well for kids, too. Dimensions: 2.5" diameter x 1.25"
These work great over jars or small glasses and clean easily. As a parent of a disabled child, this product not only keeps from messy spills, it provides some “grip” making the glass easy to hold onto. The only thing that I was disappointed about is that it only comes with one straw. Other straws do work, but the one that comes with it works the best. GoSili grabbed our attention because of their lids that make spill-proof cups for adults and kids, and for their entirely silicone travel mug. These clever solutions make taking drinks to-go—and avoiding plastics—easier and less messy. The stretchy silicone lids fit over just about any drinking glass or cup and create a spill-proof seal. And the travel mug is made entirely from silicone, but still holds its shape thanks to an embedded stainless-steel ring that gives it structure—and that is microwave-friendly for reheats, too. If you’re not on the silicone bandwagon yet, this material has a lot of good going for it. It’s non-toxic, BPA-free, and dishwasher and microwave safe. It won’t break down with use like some plastics can. And, by switching to silicone, you aren’t creating any toss-away waste.